Can this quirky newcomer rival Pages and Nisus Writer? Although Mac OS X doesn't have the 'luxury' of 50 billion word processors, it does have a handful of very good ones. 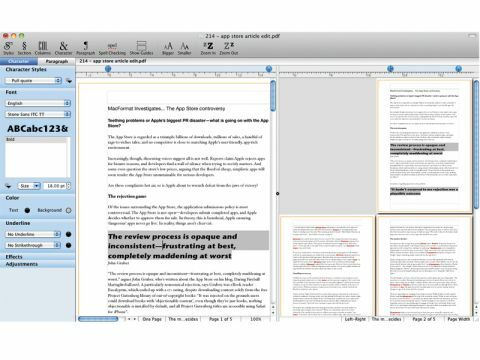 Nisus Writer (both in Pro and Express flavours) and Pages are MacFormat favourites, and Scrivener and WriteRoom are fantastic tools for bashing out text prior to formatting. Therefore, anything new in this space needs to be seriously good and perhaps offer something unique and exciting to retain our attention. Pagehand somewhat fumbles the ball and comes across as a mixed bag. The developer calls his creation "an elegant little word processor," but although we found it usable, we'd sooner describe Pagehand's interface and workflow as 'quirky'. That said, it's clear that plenty of thought has gone into the application: you can show multiple views of a document via excellent split-pane options; tabs enable you to work on several documents without windows peppering your screen; installed fonts are available as a huge list or in handy groups; and the interface aims to ensure your work is never covered by dialogs. In some cases, these things are done in a somewhat jarring way – for example, click the Columns toolbar button and its options replace the existing toolbar until you click your document content again; and although document tabs are arranged in a manner similar to Safari, Pagehand's interface isn't nearly as smooth. Generally, though, the app feels pleasant – if odd – to work with. As for the creation of content, Pagehand is hit and miss. General text editing is fine, and the application has a fairly robust styles editor and import system. It also supports columns, tables and document sections, and it's helpful when it comes to more specialised typography, making it straightforward to adjust hyphenation, ligatures and smart quotes. However, we felt somewhat restricted by a general lack of versatility in the way Pagehand deals with imagery and text flow, and the omission of a live word and character count is irksome. We're also not convinced by one of the developer's main arguments for buying Pagehand: the use of PDF as its file format. There's a certain untested logic to this, and we get the theory – PDF is near-ubiquitous, therefore if you send someone a document created in Pagehand then they'll probably be able to read it. However, any Mac OS X app can print to PDF, and Pagehand documents can't be easily edited elsewhere; worse, PDFs from Pagehand revised in the likes of Acrobat can't then be opened again in Pagehand. For collaboration, export options are available (to DOCX, RTF and so on), but you then lose your document hierarchy information (although Pagehand exports are at least fairly accurate regarding the visual appearance of your text). It's a shame to be so negative about Pagehand, because the more we worked with the program, the more little things we found to like about it. However, this release just has too many omissions and problems for it to pick up a recommendation. In its present incarnation Pagehand feels unfinished, and against the likes of Nisus Writer Express (which is five dollars cheaper) it doesn't strike us as particularly great value for money.